Shopping for my wife can be difficult. It used to be easy. She loved everything I bought her. Until after the Christmas of 2010 when I noticed a pile of clothes on the chair in our bedroom. Since she reminds me to put my clothes away all of the time, I saw an opening to point out her messy ways. You know, a little what’s-good-for-me-is-good-for-you attitude. “Hey honey, when are you going to put away the clothes on the chair?” I asked with a smile. “Oh, those are the clothes I have to return to the stores,” she replied. It was too late. I could read between the fabrics. It was obvious. She did not like my fashion sense. Everyday I am able to wear a shirt that matches my khaki pants. Women and their fashion ideas can be a total mystery and not even meddling kids and their dog can help me solve it. Thus, today, I started my Christmas shopping on line. As I was surfing for the latest fashions and sales at Sears and other websites, I found Spanx.com, which sells women’s undergarments and swim suits. My wife does not need any under garments, and my daughter warned me to never buy mom a swim suit. I guess that is something a woman has to do for herself. However, I did find the story of the owner, Sara Blakely, interesting. So, I quit the banal and tedious job of Christmas shopping to read and learn more about Sara’s story. It is much more interesting and definitely relates to the freshman experience. 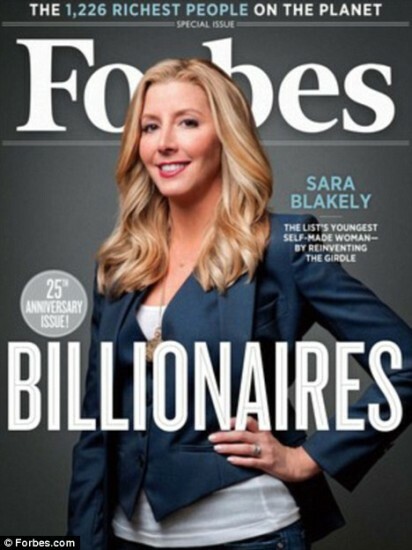 Sara Blakely is the youngest self-made female billionaire in history. She began with an idea and $5,000. #1. Sara had a driving philosophy from her father: Fail Big. Each day, her father would ask, “So, what did you fail at today.” Focusing on failing big allowed Sara to understand that failure is not an outcome. Instead, NOT FAILING involves a lack of trying — not taking a risk to better oneself. This is similar to Wayne Dyer’s philosophy in his book Excuses Be Gone that I have written about before. In the classroom, students need to fail. I do not mean they need Fs on their report cards, but they do need to rewrite or redo assignments. I have discussed my experiences here and here. We need to realize people do not attain perfection on the first try. #2. You Don’t Have to Know Everything: Sara knew absolutely nothing about women’s undergarments, patenting a new product, manufacturing, marketing, product development, website development, online commerce, and more. She did not let any of this stop her! She researched what she needed to. She hired others to do what she couldn’t do. She attacked every obstacle with energy, desire, and commitment. She did not make excuses; she solved problems. In the classroom, students will use the excuses, “You didn’t teach me how to do that, or I don’t know what to do.” Students need to know how to research ways to write. Not everything in life comes with directions, for example, my wife and children. Students also need to realize they have classmates who are better at some of the aspects of editing than they are. For example, one student may know how to use commas correctly, while another is great at using transitions. Lastly, we need to infuse the “I Can Do It” spirit into the kids, so they have the energy to try their best. They need to be able to visualize their success. After all, what we can see, we can attain. It’s ok for my wife to return gifts. She does appreciate my trying. It’s ok if I don’t have great fashion sense. I can learn. More importantly, I have a daughter who likes to shop and knows her mom’s fashion tastes! I hope you find some inspiration from Sara Blakely. How will you use these two rules in your life?